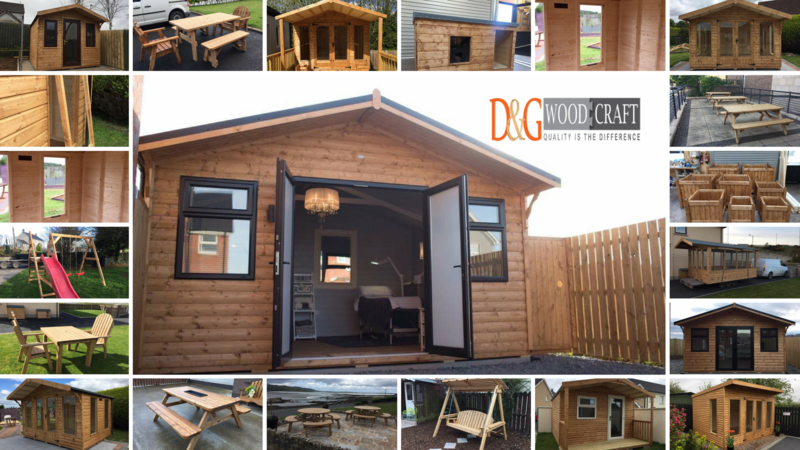 D & G Woodcraft Dungannon we create bespoke Garden furniture, specialising in custom carpentry, joinery and fine woodworking solutions for all your garden furniture. We design and build almost anything in wood ranging from garden chairs, tables, plant holders and everything for your garden. Have a look and our latest garden furniture. Quality is key to our success. We have made garden sheds and garden furniture for customers from Dungannon, Belfast, Lisburn, Newry, Armagh, Monaghan, Cavan, Fermanagh, Derry, Donegal, Sligo, Omagh and all over Tyrone, Banbridge, Dundalk, Derry, Dublin etc, People contact us from all over Ireland Noth and South because we are specialists in manufacturing high-quality sheds. Just got my summer set/picnic bench combo today and have to say it’s absolutely fantastic can’t believe the quality of it!! Really pleased and the guys were really helpful bringing it round the back of the house and setting it in place for me. Thanks again guys!! We are based in County Tyrone but cover all over Ireland if needed. We have customers all over Northern and Southern Ireland.